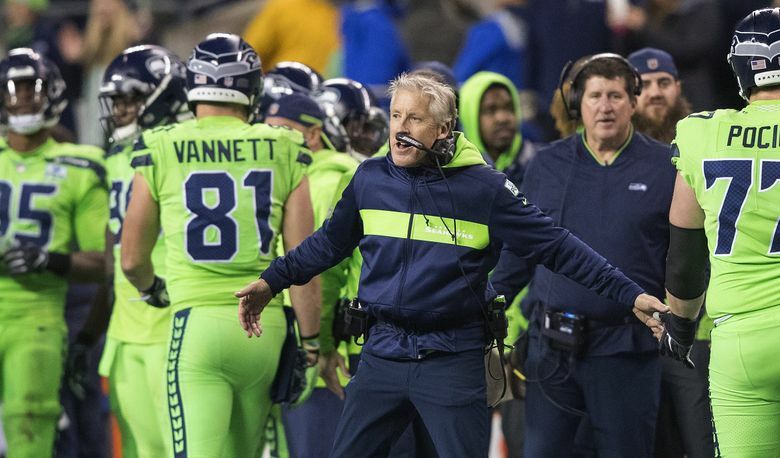 Coaching changes that drew initial skepticism but instead have paid off are at the top of the list of reasons for Seattle's surprising path to a likely playoff berth this season. NFL predictions are made to be wrong. There’s just too much that can happen for anyone to ever have a complete handle on an NFL season at the very beginning. But few NFL teams this year appear likely to defy preseason prognostications as much as the Seahawks. If Seattle beats the 49ers on Sunday in Santa Clara, Calif., it will clinch a playoff berth. And one more win in the final two games would give Seattle 10 victories, with 11 still a possibility. Seattle has won 11 or more games only five times in a franchise history that dates to 1976. Not many saw this coming. Sure, a few got it right — John Breech of CBSSports.com pegged Seattle at 10-6 and second in the NFC West. But the consensus entering the season was that the Seahawks were a fading team and that a remade roster and the loss of so many big-name vets would result in a middling season. Many, including the folks at Athlon and Pro Football Weekly, predicted a third-place finish in the NFC West and thought it would be a success if Seattle managed to not have a losing record. “Rebuilding? (Russell) Wilson must be a superhero again,’’ wrote PFW while ranking Seattle 21st in its preseason power rankings and predicting a 7-9 record for the Seahawks. And not one of the 15 NFL panelists who made picks for Sports Illustrated before the season had Seattle in the playoffs. (In the full disclosure department, my official pick for Seattle before the season, as printed in this paper, was 9-7). Perhaps only the Colts — whose preseason predictions were dire in part because no one knew what the future held for quarterback Andrew Luck — will defy predictions more than the Seahawks, while the Bears, greatly aided by the trade for defensive end Khalil Mack, are giving the Seahawks a run for their money as the surprise team in the NFC. So what did everyone get wrong about the Seahawks? Here are five reasons the Seahawks have spurned skeptics, in no particular order. Of Seattle’s three major offseason coaching changes, the hiring of Brian Schottenheimer as offensive coordinator was greeted with particular headshaking. But so far, so good on the hiring of Schottenheimer and offensive line coach Mike Solari to fulfill Carroll’s desire to get the Seahawks back to being a dominant running team and using that to become more explosive in the passing game. The hiring of Ken Norton Jr. as defensive coordinator may not have been viewed with the same import since Carroll largely sets the defensive scheme and philosophy. But if what Carroll wanted in bringing back Norton was a strong, motivational voice in the locker room and a different set of eyes in the meeting rooms, that, too, appears to have worked, especially in reconfiguring the secondary in the absence of Earl Thomas — something that wasn’t really a factor in anyone’s preseason picks since no one knew in the offseason that he would hold out or get hurt. Did you forget about Duane Brown? The Seahawks didn’t really get the full effect of Brown when they traded for him at midseason in 2017 since he almost immediately suffered a high-ankle sprain that he played through the rest of the year. Solari’s influence on the O-line has been huge, as have the free-agent signings of veterans D.J. Fluker and J.R Sweezy to solidify the guard spots. The signing of Sweezy on Aug. 1 — greeted at the time with a collective shrug by most — may be as underrated as any for Seattle this year as he was already a known commodity to the organization and able to hit the ground running. Even though he had to overcome an ankle injury in the preseason, he proved a perfect fit for Solari’s schemes. The additions of Fluker, Sweezy and Brown — players with a combined 19 seasons of starting experience — meant that for most of the season the Seahawks have unveiled a line featuring no player with less than two years as a starter. That’s a vast change from most of the 2015-17 seasons, when each year Seattle entered with at least one position manned by a first-time starter. Brown also appears to have helped right tackle Germain Ifedi smooth out the rough edges in his game, resulting in a line that can no longer be written off nationally as consisting of a bunch of converted defensive linemen and former college basketball players. However, had Walsh made one more kick against Washington, the kick against Atlanta and then another at the end of the year against Arizona, Seattle could well have been 12-4 a year ago. That he missed all three perhaps made things look a little worse than they were. That hasn’t been an issue this year, and in a league where a few plays often make a difference, that has made a big, well, difference. Sebastian Janikowski has made two last-play field goals to win games. Seattle’s punting has also been improved with the addition of dynamic rookie Michael Dickson, who has given the Seahawks some huge advantages in field position all year. After ranking 30th in net punting in the NFL last year, the Seahawks are third this season. The Seahawks have also made the kind of game-altering plays on special teams more often this season — such as Bobby Wagner’s blocked field goal last week against the Vikings — than a year ago. Did you forget how good Russell Wilson is? OK, so if you look at the passing statistics, Wilson is coming off one of the worst games of his career. Don’t let that influence you too much, though. Wilson is still having one of the best years of any QB in the NFL — and having an elite quarterback is still, over the long run, the biggest reason for any team’s sustained success. A study of quarterbacks published this week by fivethirtyeight.com rated Wilson sixth in the NFL this season in its metric of “expected points added’’ per pass play of QBs with more than 25 attempts, behind Patrick Mahomes, Drew Brees, Philip Rivers, Matt Ryan and Jared Goff. And that’s a metric considering PASSING only. Last week, even when the passing game was out of whack (Doug Baldwin’s absence was undoubtedly a big factor), Wilson still showed that he’s one of the few in the NFL who could have sealed the deal for Seattle. His 40-yard run to set up the Seahawks’ only offensive TD was the longest run allowed all year by Minnesota. Maybe Wilson isn’t running quite as much as in past years. But he still has the eighth-most rushing yards of any QB in the NFL at 306, while expertly operating the team’s zone-read game — a huge factor in the revival of the rushing attack. Sure, a team quarterbacked last year by Blake Bortles got to a conference title game. But that doesn’t happen all that often. Having a top-10 QB is still the surest way to build a successful NFL team. The 2017 result that greatly colored the national perception of the Seahawks was the Rams’ 42-7 win at CenturyLink Field in December. As this year has shown, the Rams are a true, emerging power who will likely be formidable for years. But what was overlooked that day was Seattle playing without linebacker K.J. Wright and with Wagner hobbling around at far less than 100 percent before coming out in the third quarter. Otherwise, Seattle’s defense was competitive as usual last season. Losing Thomas, Richard Sherman, Kam Chancellor and Michael Bennett made many wonder how Seattle could sustain things. But that overshadowed the most important factor: Seattle still had Wagner, its man in the middle overseeing everything. Wagner won’t win the Defensive Player of the Year Award. But as with Wilson, it’s hard to imagine a player doing more for his team. Wagner has been involved in just about every big Seahawks defensive stand of the season. Per ESPN, Seattle is second in the NFL behind the 49ers with a 50 percent conversion rate at forcing stops on third-and-one or third-and-two. That says a lot about why the Seahawks have surpassed expectations on defense. Of course, the play of guys like Jarran Reed and Frank Clark factors into that, too. But as the player who has to set the defense, then help execute it, Wagner has proved all year deserving of his rating by Pro Football Focus as the best linebacker in the league.